Novelty Cards...fun to make, especially if crafting with children. These Novelty Cards are something that children will enjoy doing. These are some really easy and fun ideas to re-create especially if you are crafting with children. Many of them just need some punched or die cut shapes, so get busy and cut out lots of different shapes ready to use. Keep them stored in a box until the next wet day and then let the kids loose. They will come up with some ideas that will amaze you. Using foam pads, double sided tape, tape runners or a dry glue stick will save some of the mess and rounded edged scissors will keep little fingers safe. Or teach them how to tear paper instead. Smaller children made need some supervision from you, but try not to influence what they do...it's much more fun to see what their imaginations come up with. Older children will enjoy using the punches and die cutter themselves to get the shapes they need. But do impress on them the need to respect and care for this equipment, then there is not a lot to go wrong. Click each of the links below to open a new window. 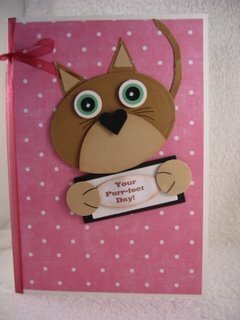 This will take you to the steps to make these various Novelty cards. Any embellishments that you have in your stash...(and that you can bear to let go of) can be used to adorn these cards. Have fun making them as colorful as you want and encourage the kids to come up with their own brand of cardmaking. Kiddies Craft Ideas for lots of fun ideas.